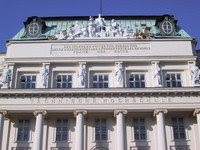 Vienna University of Technology is one of the major universities in Vienna, the capital of Austria. Founded in 1815 as the "Imperial-Royal Polytechnic Institute" (k. k. Polytechnisches Institut), it currently has about 17,600 students (19% foreign students/30% women), 8 faculties and about 4,000 staff members (1,800 academic). The university's teaching and research is focused on engineering and natural science. As of 2005, Vienna University of Technology is ranked no. 32nd of the world's 100 top technology universities by the Times Higher Education Supplement, which corresponds to the 8th rank of all European technology universities in that survey. With its eight faculties - mathematics and geo-information, physics, technical chemistry, informatics, civil engineering, architecture and regional planning, mechanical engineering and business science, electrical engineering and information technology – the Vienna University of Technology covers the classic engineering disciplines. The TU Vienna has a great pool of specialists who are acting in a wide range of different topics in research, teaching and as partners of the economy. More than 2000 scientists do their research and teaching at highly advanced and modern institutes – in summary about 70. Although fundamental research has priority at the TU Vienna applied research is also done. Moreover services are offered as high-tech problem solving and examination expertise for industry and economy. Innovation orientated companies are highly interested in co-operating with the Vienna University of Technology because of its high-tech and high-quality research and its openness for requests of the economy. The Vienna University of Technology puts great emphasis on co-operation between its own institutes as well as with other universities. Therefore the TU Vienna participates in several European Union (EU) and other research programmes. The aim of the university was and still is to belong to the best. The effort to reach this aim is also expressed in its mission statement: With the aim of providing technology for people, our mission is to develop scientific excellence and wide-ranging competence in our students.